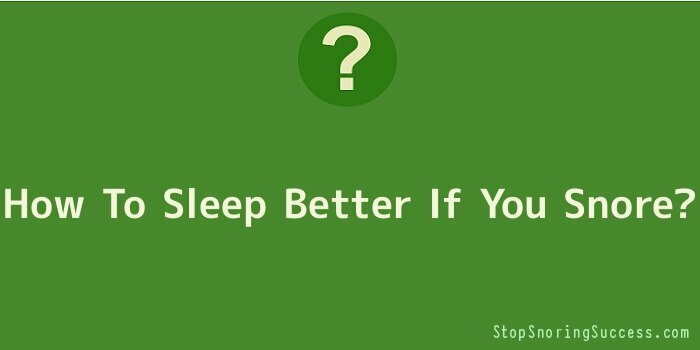 How To Sleep Better If You Snore? If you’re trying to figure out how to sleep better and one of the reasons you’re not sleeping well is because you snore, you have a variety of options. If other people in the house complain about your snoring or you wake yourself up snoring, it could be that you have a serious problem that you should discuss with your doctor. Snoring and sleep apnoea often go hand in hand. Sleep apnoea is a condition in which you stop breathing for short periods of time while you’re asleep. It’s a common condition, but it can also be serious and in some rare cases can even be fatal. If you’re a major snorer, it’s going to be hard to learn how to stop snoring and to get a better night’s sleep. If sleep apnoea is the issue, it’s best to see a doctor as there are devices that can help you sleep better without worry about the apnoea. Some people snore because they don’t breathe well enough through their nose while they’re asleep. There are products on the market that can help open the nasal airways and minimize snoring. Breathe Right strips and their generic counterparts are products of this type. These strips go over the bridge of the nose and actually stick to the skin. The strip is bent over the nose but still has some bounce to it and it pulls the nostrils open to allow easier breathing through the nose. People with allergies, colds and other acute problems often use these strips to be able to breathe better at night. But snorers and those who simply wake feeling fuzzy headed as if they were breathing under a blanket often use these strips, and feel better in the morning. If you have a mild snoring problem and you’d like to see if it helps you feel better when you wake, they’re an inexpensive product to try. Another product that’s become popular in the last few years is a special spray for snorers. The theory is that many people snore because the palate and the throat are too dry night. This spray is sprayed in the back of the throat and keeps the palate and the throat moist and lubricated. This works for many people and helps them figure out how to sleep better with nothing more than a simple spray before they go to sleep. There are also snoreless pillows that elevate you at night which can make breathing easier for many people and even jaw straps and other similar devices that are supposed to help with snoring. If you want to figure out how to sleep better, the best things you can do is experiment and find a remedy that works for you.